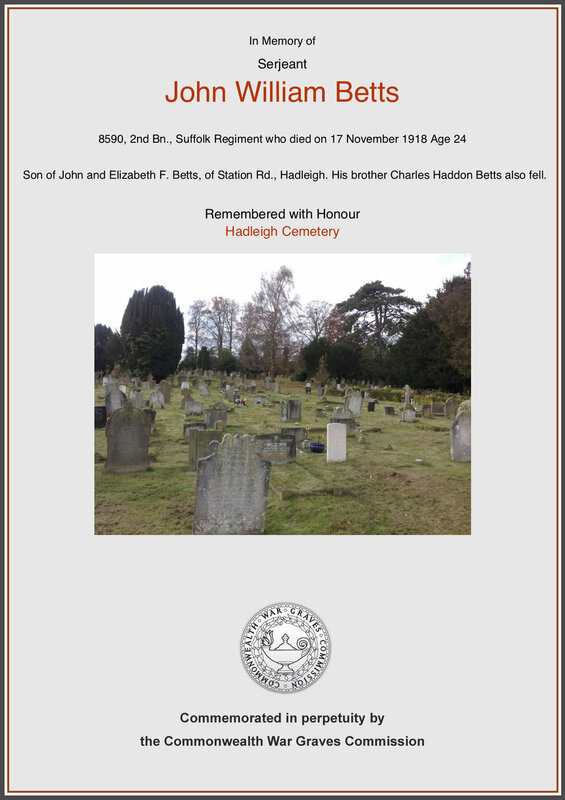 Relatives: Son of John and Elizabeth Francis Betts and brother of Charles Haddon Betts who also fell. The 1911 Census shows John aged 16 living at home with his parents John and Elizabeth and siblings; Ada Nellie (10), Albert B (8), Charles Haddon (6) and William C (3). The family were living in the Malting Cottages on Station Road. 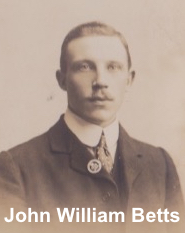 John William Betts was born in Hadleigh in 1894 the son of John Betts a maltster’s foreman. The family lived in New Cut and then Malting Cottages that once stood off Station Road near to the current entrance to Wilson Road. He was a keen member of the Scouts. 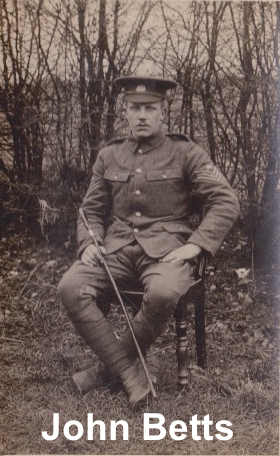 In 1912 he enlisted with the 5th Suffolk territorials but soon after on his eighteenth birthday, discharged and re-enlisted as a regular soldier in the 2nd Battalion the Suffolk Regiment. He was promoted within the first six months and was at the Curragh in Ireland at the outbreak of war. The Regiment was part of 14th Brigade, 5th Division and sailed from Dublin for Le Havre, and on arrival in France numbered 28 officers and 971 Other Ranks. Commanded by Lieutenant Colonel C.A.H.Brett DSO, the regiment was involved in the opening Battle of Mons, where it had two companies in the line along the Mons-Conde canal. It the began the Retreat From Mons, reaching the Le Cateau by the 25th August. 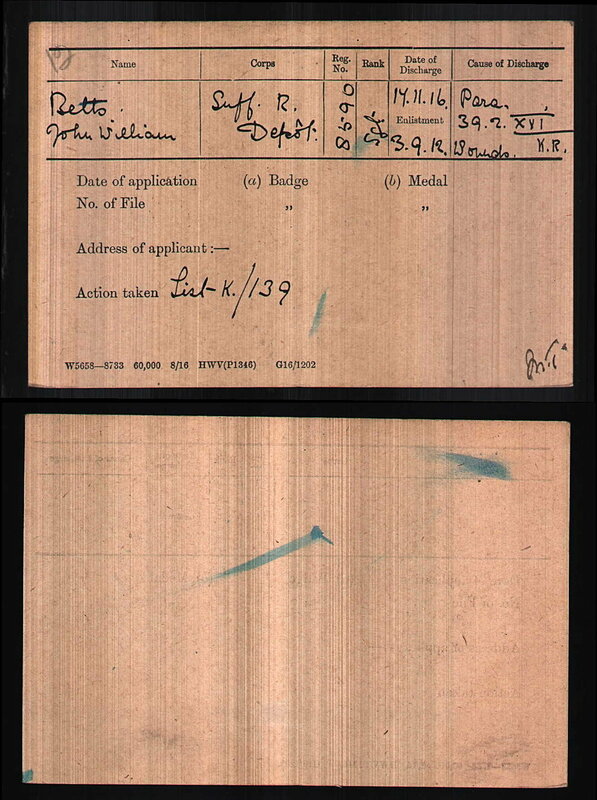 Medal Index Card showing date he arrived in France. After bivouacking at the cross-roads west of Le Cateau, it moved to the high ground nearby on the 26th and came under repeated attacks, from infantry, shell fire and machine gun fire. During one bombardment the commanding officer was mortally wounded. The Germans massed for a final attack at 2.30pm, and called upon the Suffolks to surrender. Attacks came from the front and right flanks, but the battalion was only finally overrun when the Germans worked their way round to the rear of the Suffolks positions. The survivors got away to Bohain, and mustered for a roll call in St Quentin which only showed 2 Officers and 111 Other Ranks left. John must have been one of these survivors. The majority of the losses were men who were wounded and taken prisoner. 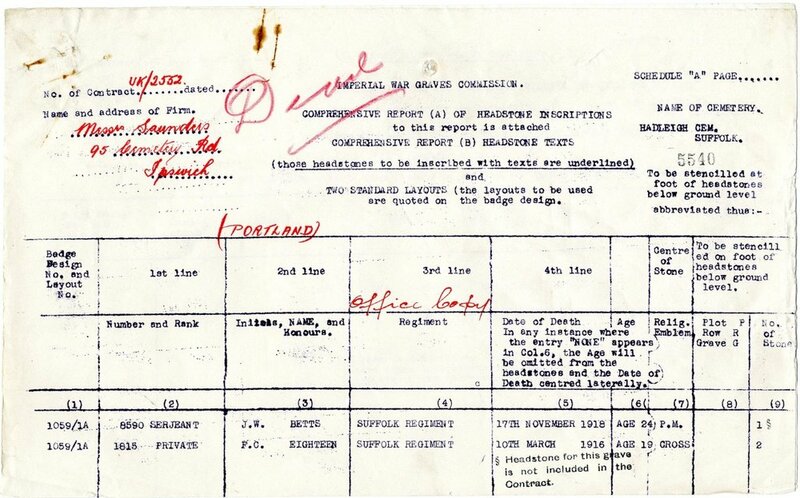 Service record showing his wounds. He remained with the battalion and was in the Ypres Salient on 22 Apr 1915 when the enemy launched their Spring offensive. This was the day that the enemy used Chlorine gas for the first time and on that day John received a gun shot wound to the left wrist. He must of recovered from this wound because he remained with the regiment. In May 1916 he was wounded again at Kemmel, this time it was more serious and he suffered severe head, arm and legs wounds and was evacuated back to hospital in Britain. 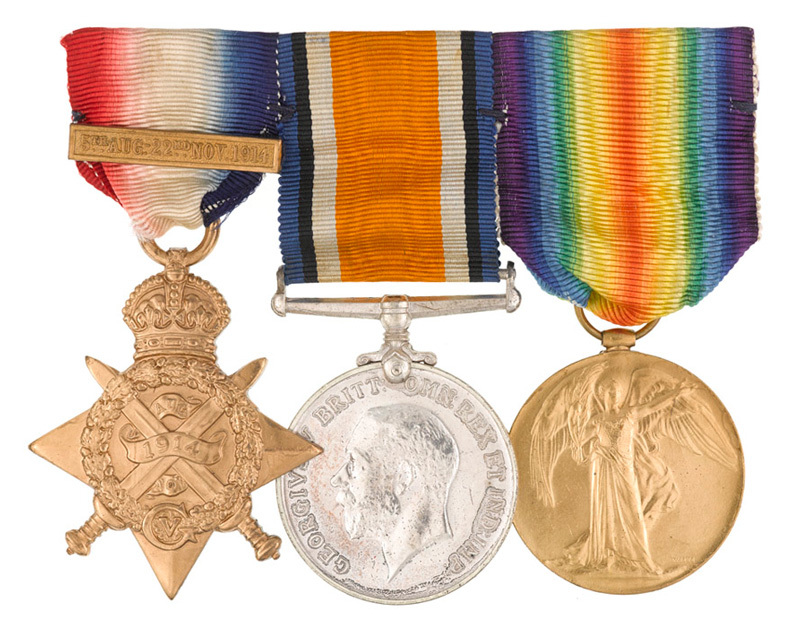 He spent six months in King George’s Hospital London before being discharged from the Army in November 1916. 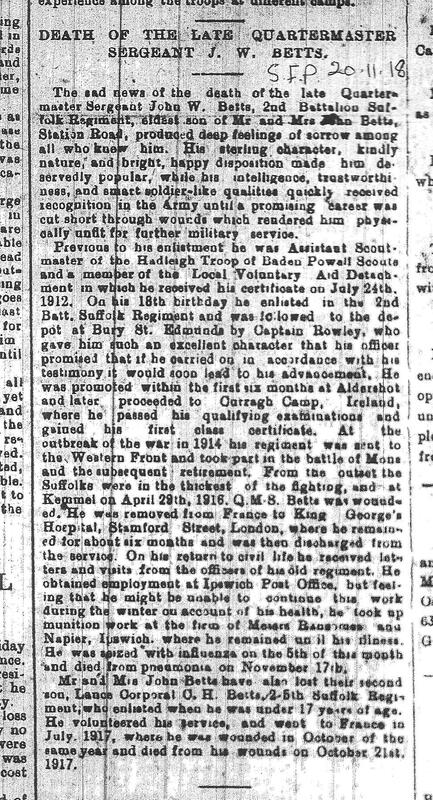 He found employment first at Ipswich Post Office but feeling that he would not be able to continue this work in the winter months due to his health, he took up munition work at the firm of Ransomes and Napier in Ipswich where he remained until he was taken ill. 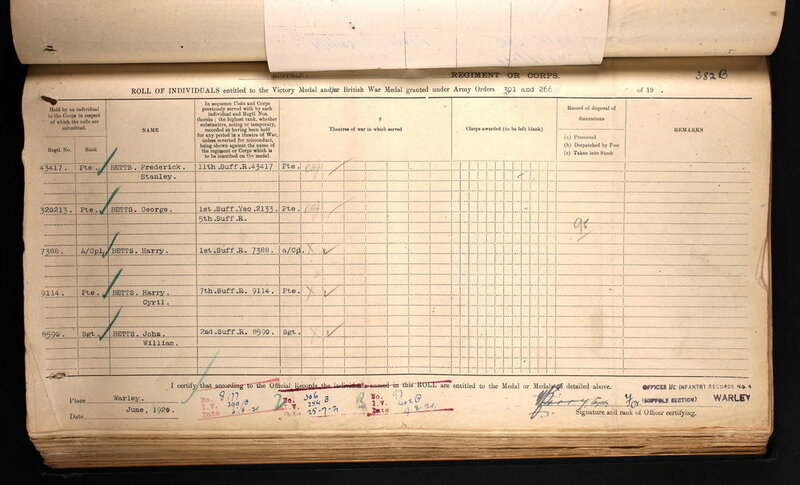 He contracted influenza on 5 November 1918 and lived one week into the Armistice before he died of pneumonia. John William Betts had a military funeral which started from his home in Station Road led by 5th Suffolks Volunteer Battalion. As the cortege made its way to the cemetery, the boys from the Bridge Street school lined the street to pay their respects. A large congregation gathered by the grave side and the service ended with three volleys discharged by the firing party. 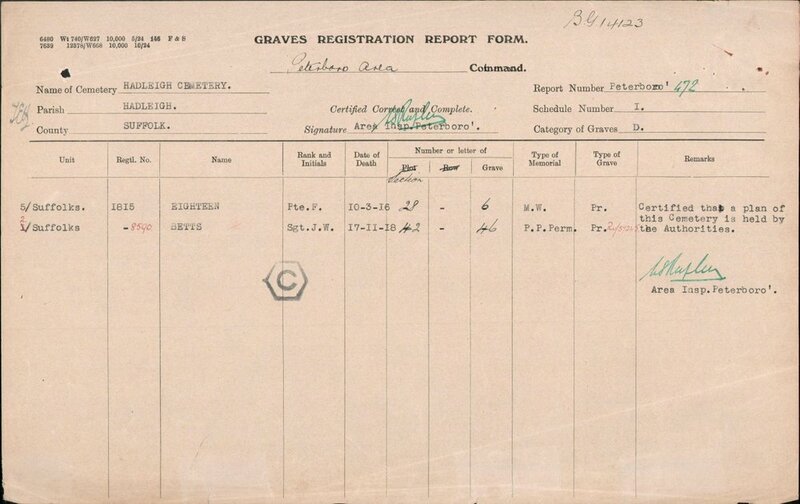 John’s parents pre-emptied the Imperial War Graves Commission and erected a private headstone on John’s grave. This gave them an opportunity to include a memorial to John’s younger brother Charles Haddon Betts who died of wounds in 1917 and who lays in Etaples Cemetery in France. Both brothers are remembered on Hadleigh War memorial. 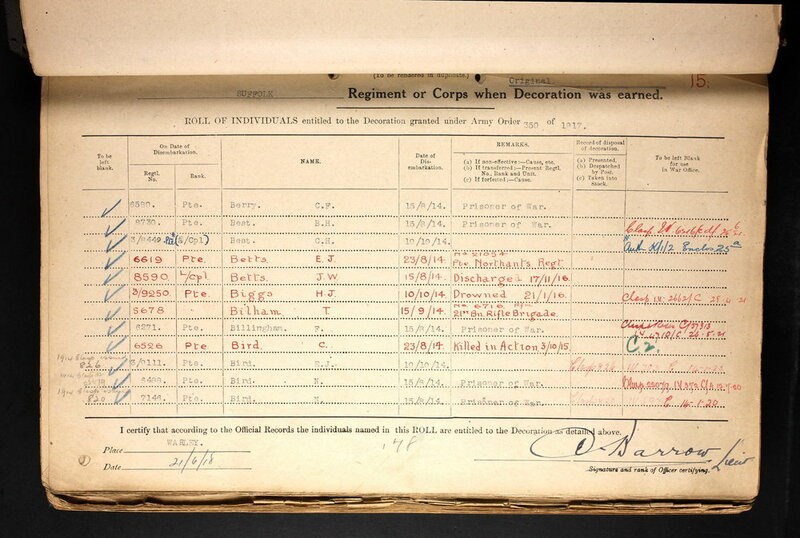 We hope that this page has been able to tell the story of John William Betts. If you know of any information which might help to add to the story then please get in touch.